A cigar review website written by a woman for all lovers of the leaf. 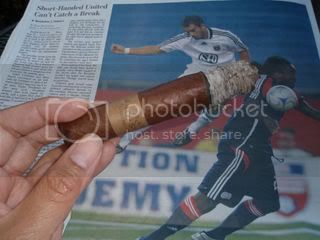 Here is still another Nicaraguan Habano Criollo wrapped cigar that I just adore. The Kristoff Criollo is a handsome 50 by 7 inch churchill with an Olor Cuban seed Dominican binder containing Olor Cuban seed Dominican and Nicaraguan filler tobacco. The wrapper is oily and sports a cute pig-tail cap and covered foot. It's reddish brown in color along with dark striations and splatters. It's rustic look goes well with it's cleverly designed vintage fabric looking cigar band. The cigar feels packed full of tobacco and when I clipped it with my Palio, it gave me a perfect draw with nice resistance to it. The pre-light draw flavors showed spiked fruitcake while the cigar itself smelled of sweet cedar with notes of white pepper, floral aspects and mild cinnamon. The cigar's shaggy foot lit easily and evenly. The body of the smoke was in the medium range with light medium flavors. You get a tasty woody flavor with nice sweetness on the finish. The characteristic Criollo flavor is there as well as some hints of cocoa powder. The spice is nice and mild and balances the cigar out perfectly. The flavors are pretty consistent throughout the first half of the cigar as it builds in richness. The body remains in medium but the flavor has nice subtle complexities. I can detect a floral quality, roasted nuts and leather coming through. The Dominican Olor gives the cigar a slightly dry finish that only water can quench. The final third is as smooth as the first two with rich leather, roasted nuts and pepper spice on the finish. I love the easy way this cigar smokes. It burned perfectly straight throughout and formed a nice light gray solid ash. 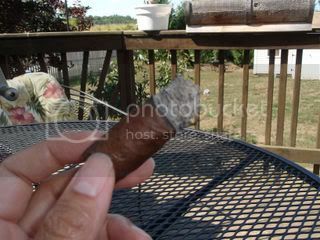 The flavors are highly enjoyable and the spices not too extreme, so I think even beginners can enjoy this cigar as well. The Kristoff Criollo is available in three other sizes of stockier ring guages and is priced modestly at around $6.40 to $7.40 a stick. Kristoff also comes with a Brazilian maduro wrapper which is just as oily and scrumptious looking. I hope to eventually review that as well. Until then I'm going to continue to stock up on the Criollos and smoke them down to the nub! Hello, my name is Glen Case, the owner of Exclusive Cigars and the manufacturer for the Kristoff. I just wanted to say thank you for the wonderful write-up and for being a fan of the Kristoff. You will have to try my new Kristoff Ligero (Maduro and Criollo) which will start hitting stores in three weeks. Also be on the look-out for my new Vengeance Series 98 and Maduro Ligero which started hitting stores this week. Thanks again! I look forward to future reviews. Wow, what a nice surprise to know that cigar manufacturers are checking out the blogs being written about their products. Thanks for commenting Mr. Case. I look forward to trying your new cigars when they come out. View my page on Women who Smoke Cigars!